This time of year I eagerly await the arrival of local nesting birds which have wintered elsewhere. One such returnee, a short-distance migrant, never fails to make me smile when I hear its bold, ever-varied notes, given usually in twice-repeated phrases. It’s the brown thrasher (Toxostoma rufum), a bird that has delighted me ever since one sang non-stop from a thicket as I tended our vegetable garden in northern Virginia over forty years ago. When we moved to Illinois in the mid-70s, I was thrilled to find that brown thrashers live and breed in the Barrington area, so I continue to enjoy their company from spring to fall. But thrashers are not abundant around Barrington nor, for that matter, in most places where they breed. They require shrubland habitat – not forest, not prairie, not yards, but areas dense with wild shrubs and vines and small trees – that is increasingly uncommon. Locally I find thrashers most often in forest preserves such as Cook County’s Spring Creek and Crabtree preserves and Lake County’s Cuba Marsh. It is in dense tangles that the brown thrasher makes its bulky, twiggy nest, usually hidden from view and often nestled among thorny branches. That preference for dense shrubbery is surprising, given the bird’s size. 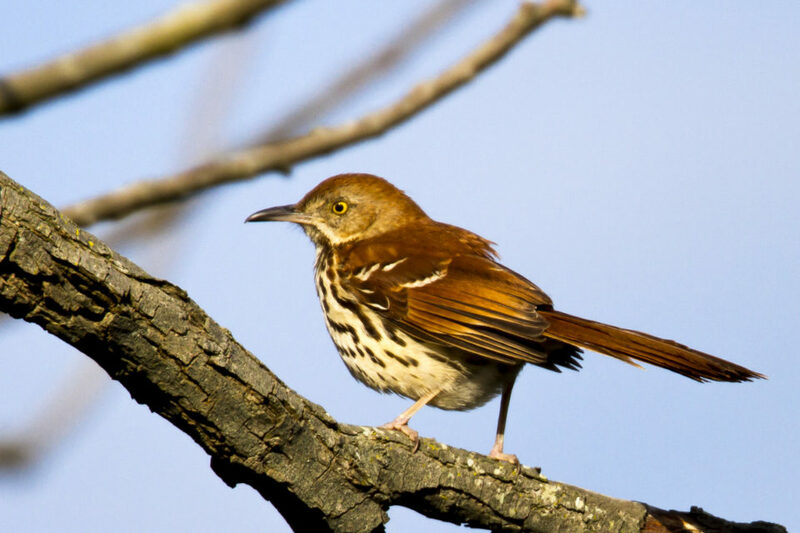 The brown thrasher, relative to many songbirds, is large, about the size of a blue jay. To my perception it is exceedingly handsome with rich, chestnut plumage, a boldly streaked breast, longish, decurved bill, and piercing yellow eyes. Audubon called the species the “ferruginous thrush”; early naturalist Mark Catesby called it the “fox-coloured thrush.” It’s easy to identify in flight with its slender, rufous body and surprisingly long tail. The brown thrasher is also easy to identify when perched. If you enter one’s territory, especially when it is singing, you usually need only to scan nearby treetops to find the bird. While it may prefer dense shrubs for nesting, it opts for high, visible perches for its vocal performances – and what performances they are! One of our “mimic birds” – the others are the northern mockingbird and gray catbird – the thrasher belts out an ever-changing repertoire of phrases, most often repeated two times each. Some studies claim that it can sing more than 1,000 different song types, including copies of other birds’ songs. Fortunately for me, the part of Spring Creek Forest Preserve for which I’ve conducted breeding bird surveys for many years almost always hosts two to three pairs of brown thrashers. When I hear their notes, I brighten up and know I could watch them for hours if I didn’t have a count route to finish. One cannot remain glum in the company of a singing brown thrasher, a master of vocal improvisation. You will see what I mean if you encounter one on an outing this spring or early summer. Wendy also leads a series of spring and fall bird walks in the Barrington area with Citizens for Conservation. For the full schedule of Wendy’s Spring 2016 walks, CLICK HERE. You an also CLICK HERE to explore all of the local bird profiles featured in Wendy’s monthly Birds of Barrington series at 365Barrington.com. Next post St. Michael's Little Angels Preschool Celebrates "Week of the Young Child"